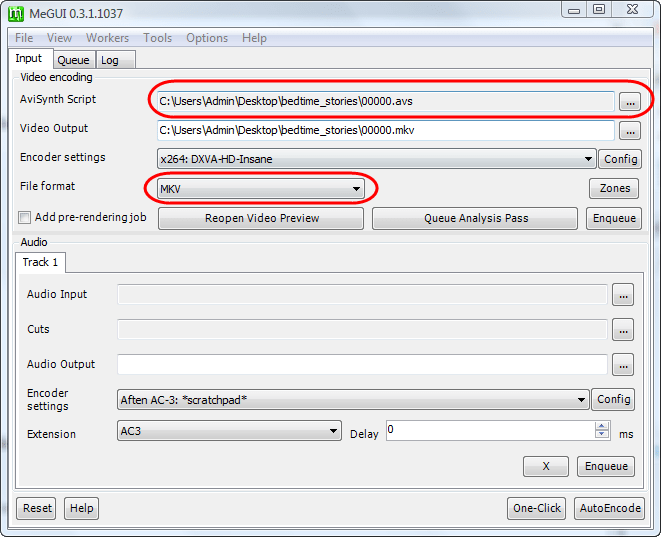 This guide will show you how to re-encode a Blu-ray movie to a x264 Matroska container (.MKV). Before starting please note that most computers will take over 32 hours to encode a 1080p movie with the recommended profile here (although you can also do a much faster profile which I will briefly cover). I do not recommend encoding on any laptop/netbook or desktop with lower specs then an Intel 2.4 Ghz Core 2 Duo. 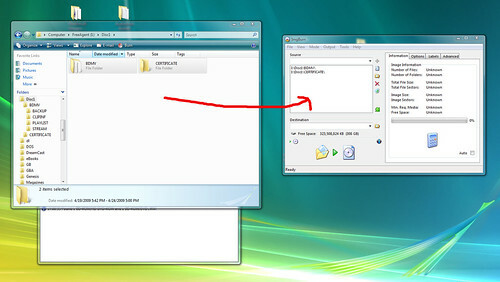 On lesser computers you may not be able to multitask or even move your mouse until encoding is complete. It took about 18 hours to encode the movie in this guide at an average of 9.74 FPS on the first pass and 2.78 FPS for the second pass on a Intel Core i7 @ 2.66 Ghz with 12GB of RAM and the HDDs in Raid0. Whatever computer you use, ensure that it has adequate cooling. Open MeGUI and update everything (an update screen should open on it’s own), when asked to import presets select and import everything. Close MeGUI. It may be a good idea to restart your computer at this time. Put the Blu-ray disk in your drive. 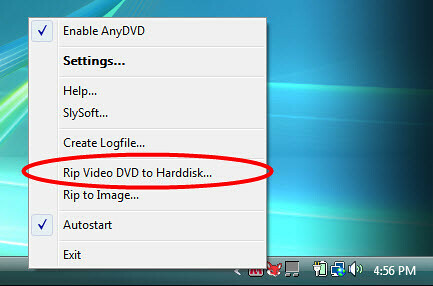 Rip BD to Harddisk with AnyDVD (ending with step 3). Go to Menu Bar > Tools > AVS Script Creator. Input the main movie, found within BDMV > STREAM (normally the largest *.m2ts). A preview window should open — leave it open. 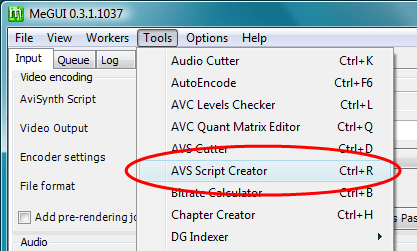 Leaving the preview window open, pull up the “AviSynth script creator” window again. More options should be visible. Tick “Crop” and then click “Auto Crop” (you may need to manually crop). Next tick “Resize”, if you know what the true resolution is type it in, if not tick “Suggest Resolution (mod16)” then untick “Suggested Resolution (mod16)”. Set Input DAR to ITU 16:9 NTSC. 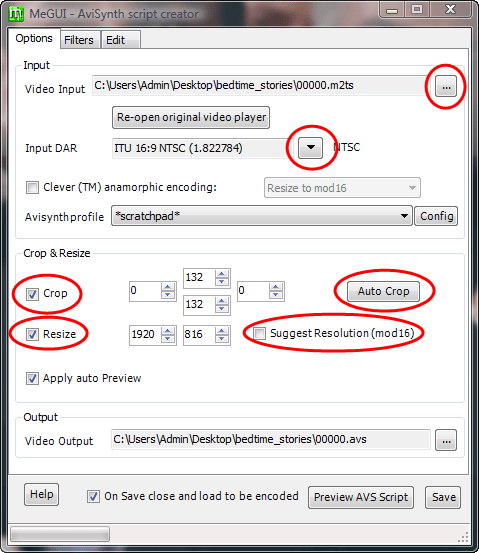 If you want to do a 1080p (source) encode skip to step 4 (which I will be doing), if you want to reduce the resolution to 720p continue with this step. My movie is 1920 x 816 (see the resize field), so I will use a table to figure out what resolution I must use for a 720p encode. Once you figure out your new resolution, type it in the resize fields. Go to the last tab, titled “Edit”, this is where you can add filters such as ‘sharpen’. Generally with 1080p encodes you will leave the encode as close to the source as possible. While it is very detailed and complex what this actually does, in short it can improve your encode and make everything a little smoother. Uncheck “On Save close and load to be encoded”, and then save. If the MeGUI Script Creator and preview windows do not close, you can do so. Now we get to work with the audio. 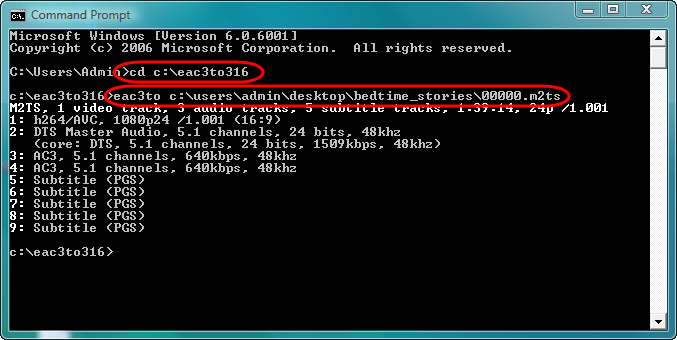 To check what audio streams you have to work with, open Command Prompt (Start > All Programs > Accessories). You must change CMD to use the directory eac3to is in. I extracted eac3to to my C drive so I must type “cd c:\eac3to316” (316 is the build number). I placed Bedtime Stories on my desktop in a folder called “bedtime_stories” so I must type “eac3to c:\users\admin\desktop\bedtime_stories0000.m2ts” (please note that this will not work if you have a space in any of the folders or file names). After processing the streams, eac3to will list them (explained below). 1) H.264/AVC this is the video, you can also see that it is 1080 pixels in hight, runs at an average of 24 FPS, and has an aspect ratio of 16:9. 2) DTS Master Audio this is an audio stream, you can see that it has 5.1 channels (used for a 5.1 surround sound system), and has a bitrate of 1509. This is the one we are looking for it can be called many different things, take note whether it is an AC3 stream or not. 3 & 4) AC3 this is another audio stream, Bedtime Stories was released with both French and Spanish languages as extras so this is one of those, bitrate of 640. 5 – 9) These are all subtitles, I’m not entirely sure what they all are although the movie includes English, French and Spanish subs. Remember the track position of the desired audio stream. 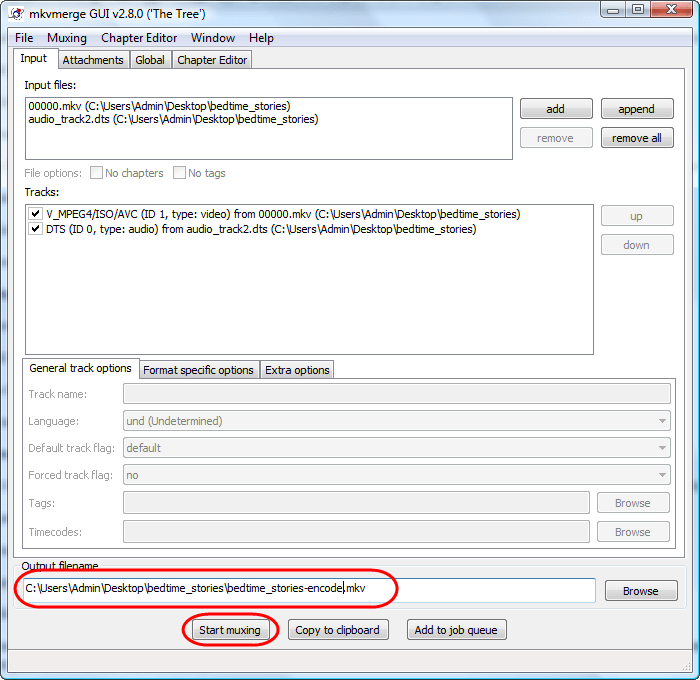 Wait for eac3to to extract your audio (continue with step 6). 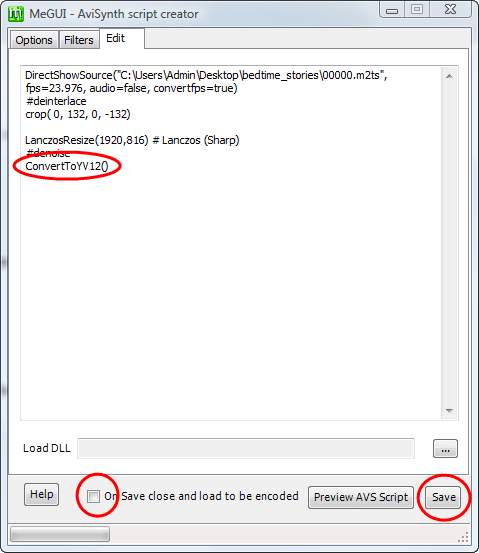 If the audio is a form of DTS (such as this one) or True-HD you must have SurCode installed before continuing. Wait for eac3to and SurCode to decode the audio to *.wavs, then encode to a *.dts. Now that we know what format of audio we have we can calculate the bitrate. Import the AviSynth Script that we just created (under video not audio), a preview window should open — you can close it. Set the file format to MKV. 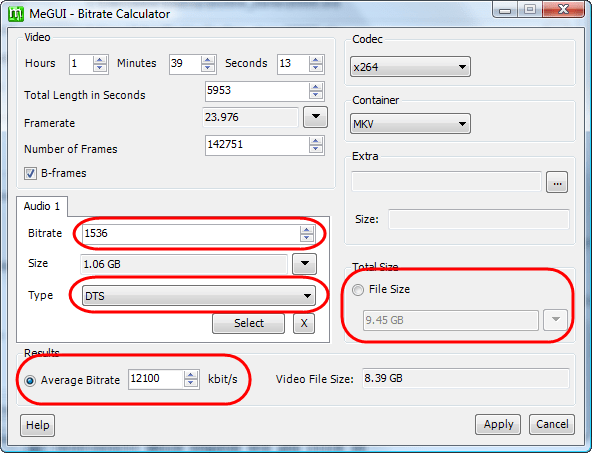 To set the bitrate we must go to Menu > Tools > Bitrate Calculator. 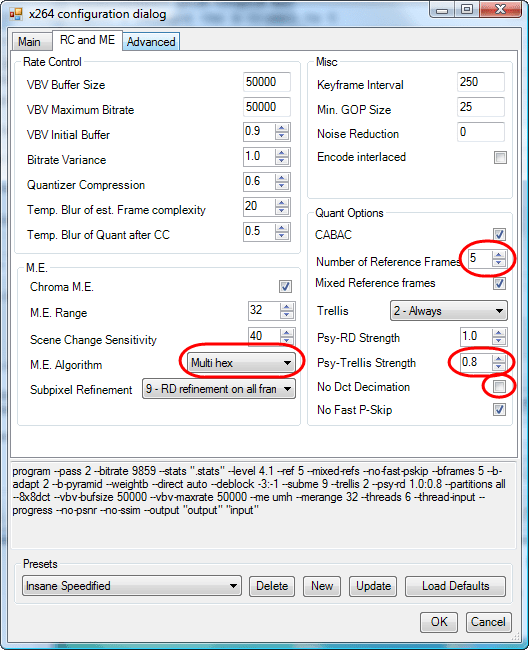 For audio type select the format you will be using (AC3 or DTS), for AC3 set the bitrate to 640 and for DTS set it to 1536. Now you will have to decide on a bitrate. While every movie is different, I normally choose a bitrate anywhere from 9,000 to 14,000 kilobits/second for 1080p and about half that for 720p based on test encodes. This is definitely an art! For Bedtime Stories I found 12,100 kb/s to be good. 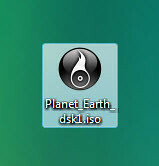 If this is your first encode I would recommend using a preset of 1 DVD-9. Click “Apply” (if asked to copy bitrate to video settings hit Yes). 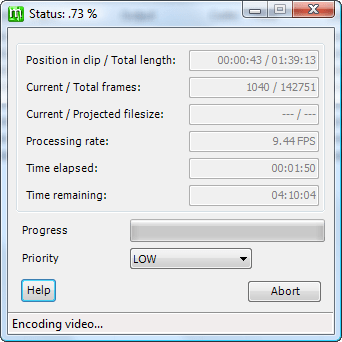 For encoder settings we will create a custom profile, although use “x264: DXVA-HD-Fast” if your computer is slow or you don’t care much about quality and want to shorten the time to encode by about 3x (then skip to step 8). Set profile to “x264: DXVA-HD-Insane” and click “Config” to change some settings which will speed things up. 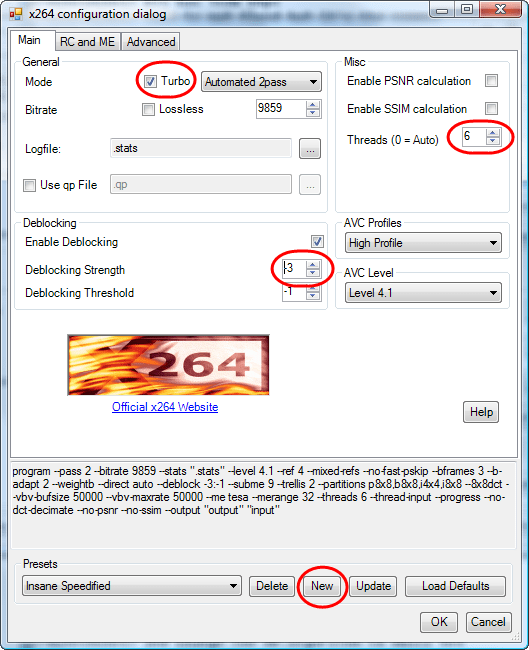 Check Turbo, increase Threads to 6, and change the Deblocking Streagth to -3. Go to the next tab (titled “RC and ME”), increase Number of Reference Frames to 5, uncheck “No Dct Deimation”, change M.E. Algorithm to “Multi hex”, and increase Psy-Trellis Strength to .8. 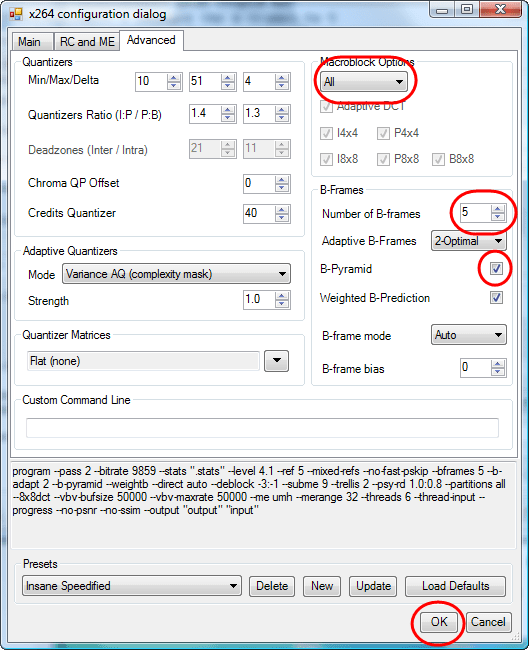 Next tap (“Advanced”), increase number of B-frames to 5, check B-pyramid, choose “All” for Macroblock Options. You will be asked if you want to update the selected profile click “Yes”. Now to encode the movie! 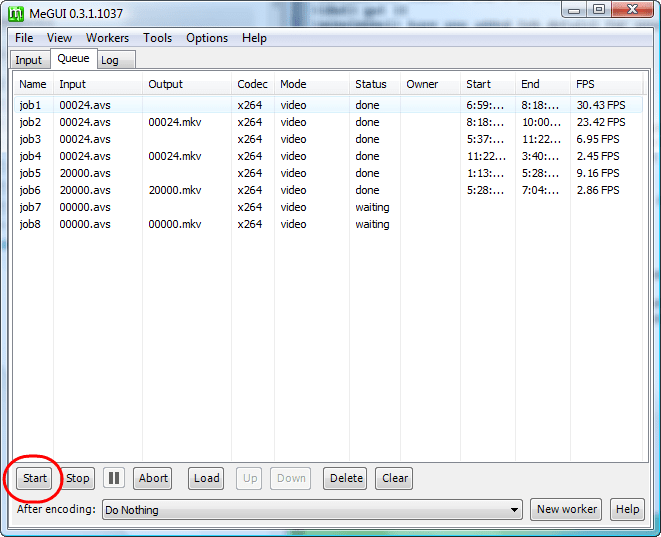 Hit Enqueue (the one in the video encoding box), this will queue your movie. Go to the next tap called Queue, and hit Start. A new dialog box will open reporting the current speed at which you are encoding along with other helpful info. At this point you should have an AC3 or DTS audio stream, and an MKV with no audio. We now need to MUX them together into a single MKV. Open “mkvmerge GUI” (installed with MKVToolnix) and the folder your files for encoding are in. Drag both streams to the input box in mkvmerge. Change the file name of the output so it will not overwrite the source. Hit “Start muxing” and wait a few minutes… Yay! You completed your first encode, you should now be able to play the movie in your favorite media player! Check back for our guide on adding subs to encodes! While you are waiting (it may be a *long* while out), experiment with SubRip to add subtitles to your encode (this can be helpful when the date or location of a scene is not part of the screen but a subtitle). Post a comment and let us know if you have any tips, questions, or just want to let us know how it went! Shouts to all of the people and sources who are not listed. I could never have learned how to encode without them! Check with your governing laws before downloading/installing/enabling/using any of the programs listed here! You assume full responsibility! This cool Humanoid was built by builder Orac to interview guests at a TV studio in the UK. Sadly it does not look like the recorded segment will air, replacing it with genuine human. Orac commented that he hopes to “enjoy the fruits of [his] labour” by finding some other job for his little friend! It will be interesting to see where Sir Kitt shows up next! This guide will show you how to watch ripped Blu-ray movies on your computer/HTPC (Home Theater PC) with PowerDVD. 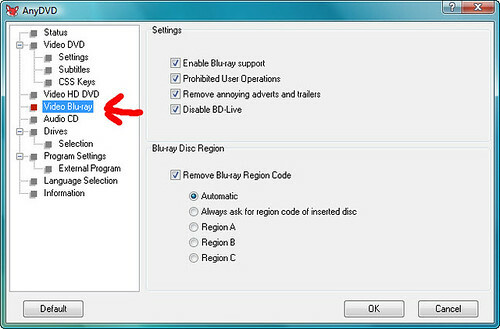 Check if AnyDVD is removing protection from Blu-ray. If not already completed, insert your Blu-ray disk in the drive now. 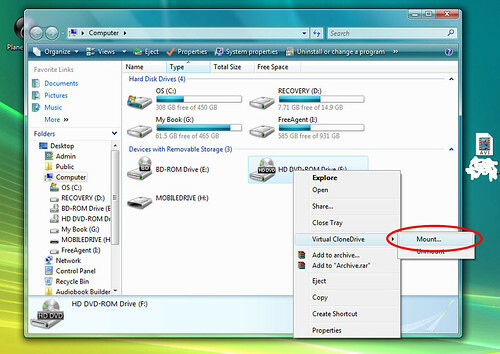 Right click on the red fox icon and click “Rip Video DVD to Harddisk”. 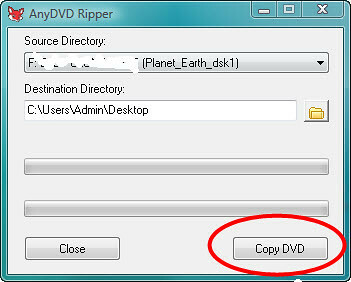 Once the dialog box opens select the source drive (normally drive E) and the destination (a folder under your desktop works good), click “Copy DVD”. 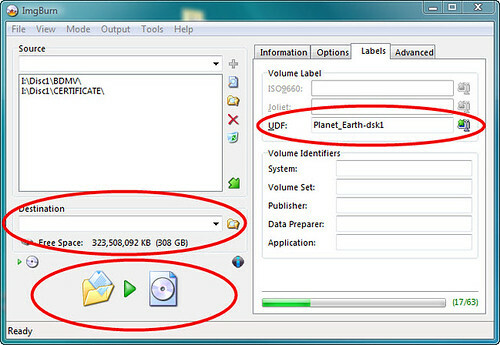 Within the rip folder add the following folders (some may be empty). 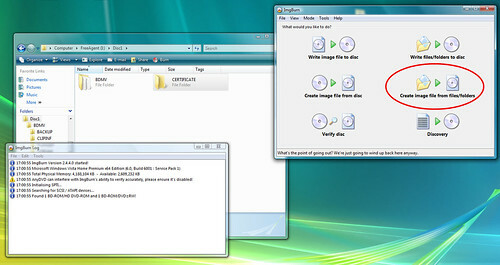 Open ImgBurn and choose “Create Image from Files/Folders” (may differ from version to version). Drag the BDMV and CERTIFICATE folders (plus any other folders that may be there) to ImgBurn. Under “Options” set File System to UDF and UDF Revision to 2.5. 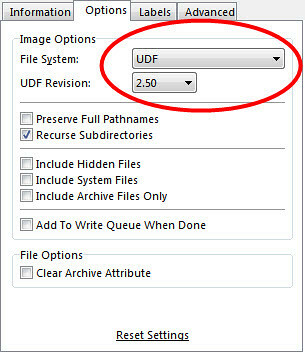 Under ‘Labels’ type the name of the movie in the UDF field and select the destination for the ISO. Once complete, continue. ImgBurn will now create your ISO (this process will only go as fast as your computer/HDD, so RAID0 helps!). 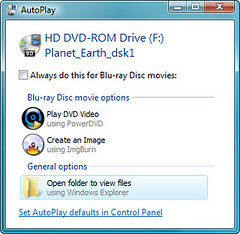 To mount the ISO for playback with PowerDVD go to Start > Computer (“My Computer” for XP users). AutoPlay should now open and you can watch your movie. Now where’s the popcorn? Post a comment and let us know if you have any troubles. See our Guide For Blu-ray Quality x264 Encodes! This guide has been largely based on the “Guide for Unprotected Blu-ray ISO for PowerDVD”, by Adbear… Thanks for this great info mate! Check SlySoft’s AnyDVD HD forum for unsupported movies and be sure to update AnyDVD often! 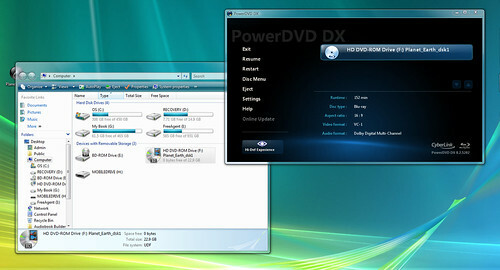 Check with your governing laws before installing/enabling/using AnyDVD! You assume full responsibility! As of February 17 2008 we have not heard any official or unofficial reply from Dell regarding the Dell Studio XPS. I have been using Dell hardware since 2002 with Windows XP and have been very happy with the quality and manufacture support (my first Pent4 laptop from Dell has had over $500 in repairs at no cost to me, the second laptop bought in 2007 from Dell has never needed repairs at the time of writing). Back in November 2008 I ordered a Dell Studio XPS 435mt for HD video editing although due to backorder I received it in December. Overall the Studio XPS 435mt is well worth the price receiving some of the best benchmarks, but ever since first startup though it has been *very loud*. About 2 weeks after a call to Dell about this issue, a “computer service person” from Dell came to my house to replace 2 fans which did not help at all. After this attempt from Dell and being told that the noise is in a “normal range”, I checked online for ANYTHING that could solve my problem. At the time (now in early January) I found 2 sites. One was Desktop Review which reported that “once it [the fans] happened with such suddenness and ferocity that I almost jumped”. The other site was VOIDWARE contributor “hugh” which said that “the old case fan is audible” and “wanted to improve the case cooling and noise reduction”. The solution hugh used was to replace the case fan with a Xilence 92mm fan from QuietPC. After hugh’s mods (see WOIDWARE for everything he/she did) they reported that “at 25% fan, it’s pretty much inaudible and the GPU runs at under 50 degrees running the desktop”. After a 4 week backorder on the new fans from QuietPC, and replacing the case fan with the same fan hugh used, my GPU runs at 73C idle (about 30C degrees higher than before the fan replacement) this is not an acceptable temperature. Today (Sunday, February 15), being the day after the case fan replacement I’m not entirely sure what I will do as a next step. Some helpful information includes the Dell Community who’s member “oc1” said that “The fan that I took out of my 435MT is rated 70 CFM”, while 70 CFM may be a little high of a number, the Xinence 92mm fan is rated at only 27.45 CFM. oc1 also said that they “got the Nexus fan from endpcnoise.com in Vancouver, Washington”, after a week of usage oc1 said that with the Nexus the CPU was “running from 39 to 44 degrees Celsius” although at the same time admitted “I haven’t really done anything like video rendering that really puts a load on the processors”. Fixes that I am considering is the Nexus fan, Anti-Vibration Feet (like furniture pads), Anti-Vibration Fan Mount, and Fan Gaskets I may also try Acoustic Materials. Please comment if you have any tips, or are having the same issue! Remember to use a static strip before working on electronics. Neither the author, nor RIBO Labs is affiliated with any of the manufactures, companies, or products listed. We are completely independent. A new wave of mind control will be upon us soon, this time for the end user! We have seen the WiiMote bring greater levels of human input to gaming in a huge scale (over 29.62 million Wii units sold at the time of writing). The Wii also brought down the cost of this technology so more people could buy it. The Nintendo DS (NDS) and Apple iPhone brought touchscreens to the mainstream. So why not take game control to the next level? Emotiv is doing just that, mind control for PC games. I first saw this new interface device back in early 2008 thinking it would be amazing if brought in the real world. My idea was to interface this with a Windows program for remote controlling a NXT robot. If a success, interfacing it with a humanoid robot. In the last week I have been playing with the SDK to great success! 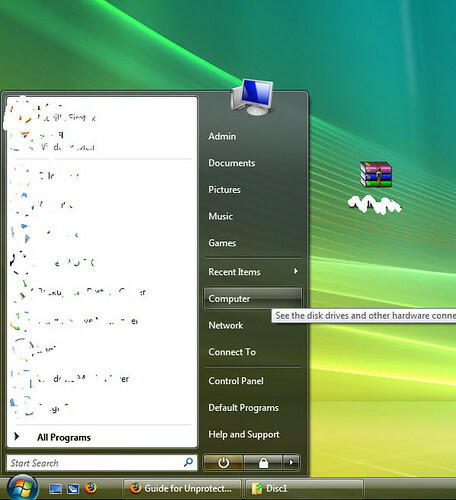 The “EmoKey” program can link different thoughts, emotions, or facial motion to input key commands to your Windows PC which I can then use to control a robot. Sadly the Emotiv EPOC costs $299 (USD), a bit much for what I’d be doing… I did not even know *if* this would work for physical objects (what I am trying to do) up until a few days ago! I was watching a recording of the Discovery’s new show “Prototype This!” where the team built cars that would shut off if the builder gets angry (which also triggered for excitement). 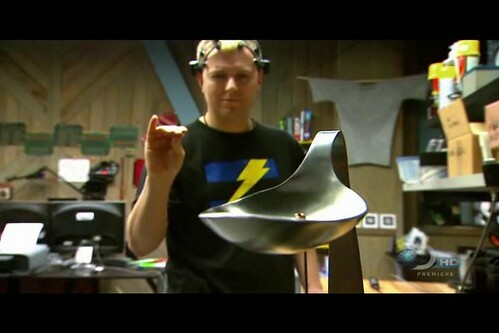 There was a beautiful test where they bent a spoon by “pushing” with their mind at the spoon, sending input to the computer, then sending an articular a message to pull on the spoon (seen below). You can see the full episode on the Discovery website until January 15, 2009. Public release is set for Christmas 2008! Will this make PC gaming cooler? Will mind control be successful? Will Nintendo fight back? Where will this next gen technology be going next? The GumStix Verdex product line will not be sold after December 2008. The good news is that the Texas Instruments base “Overo” line will replace the old design, while the Verdex Pro will still be sold. Overo is *smaller* then a single piece of gum (unlike the Verdex and Verdex Pro which are the size of a stick of gum)! Starting price will be less then the XL6P, with more power! Overo will have a USB Host so existing robotic daughter boards should still will work.